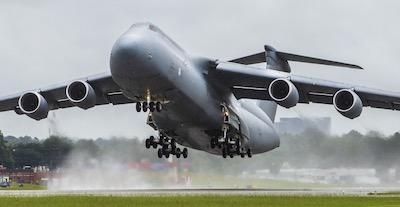 Lockheed Martin has delivered the 52nd C-5M Super Galaxy strategic transport modernized under the U.S. Air Force's Reliability Enhancement and Re-engining Program (RERP) on Aug. 2 at the company's Marietta, Georgia, facility. The delivery completes the RERP upgrade, which extends the service life of the C-5 fleet out until the 2040s. The heart of the system is the GE F138 turbofan engine (known as a CF6-80C2L1F in the commercial world) de-rated to 50,000 pounds of thrust on the C-5M. This engine provides 22 percent more thrust than the out-of-production TF39 turbofans on the earlier C-5A/B/C aircraft. The engines also allow the C-5M to meet the FAA's Stage 4 noise reduction requirements. 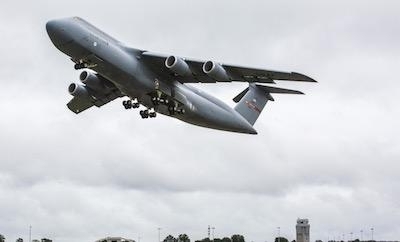 These changes, taken together, result in a 22 percent increase in thrust, a shorter takeoff roll; a 58 percent improvement in climb rate; allows the C-5M to cruise—at maximum gross weight—in the Communication/Navigation/Surveillance / Air Traffic Management (CNS/ATM) flight environment; and greatly enhanced fuel efficiency and less tanker support demand. The C-5 Galaxy has been operated solely by the U.S. Air Force since 1970 and is the largest strategic airlifter in the U.S. Air Force's fleet. The C-5 is capable of carrying two 78-ton M1A1 main battle tanks or helicopters and other large equipment intercontinental distances. Fully loaded, a C-5 has a gross weight of more than 800,000 pounds. All of the C-5s were built at Lockheed Martin's Marietta site.